Nikwax Footwear Cleaning Gel™ is a highly effective cleaner which has been specifically designed and optimised for breathable waterproof footwear.Nikwax Footwear Cleaning Gel™ is a safe product to use on breathable waterproof footwear as it does not leave water attracting (hydrophilic) residues, which lead to fabric and leather absorbing water and `wetting out`. 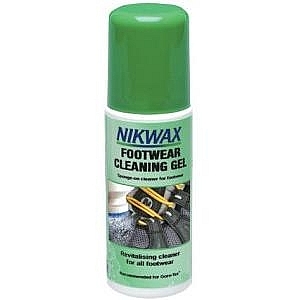 Nikwax Footwear Cleaning Gel™ removes water absorbent dirt and stains picked up during use; this revitalises Durable Water Repellency (DWR) and causes water to bead on the outer surface.Regular cleaning with Nikwax Footwear Cleaning Gel™ will revitalise existing DWR and revive breathability of your footwear, keeping your feet dry and comfortable. 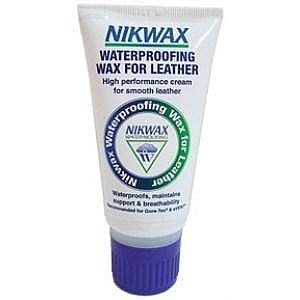 Nikwax Waterproofing Wax for Leather™ is a safe product to use on breathable waterproof footwear. It provides instant Durable Water Repellency (DWR), maintains breathability and replenishes tanning agents in leather. 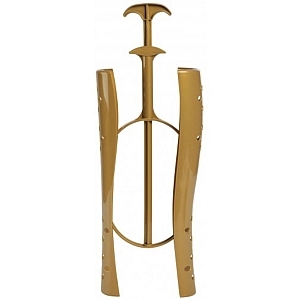 It is non-flammable, contains no harmful solvents and is free of volatile organic compounds (VOCs) and fluorocarbons. 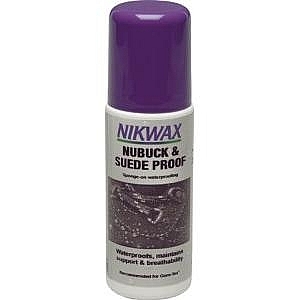 Nikwax Waterproofing Wax for Leather™ has been specifically designed and optimised for smooth leather footwear. 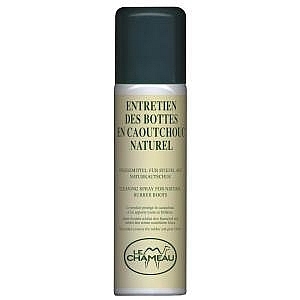 The WaterBased formulation is directed to leaks, can be used on wet or dry leather and will not over-soften. 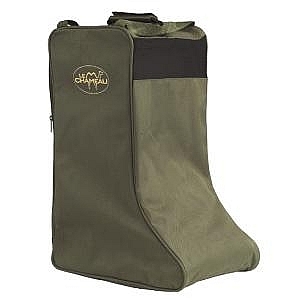 At last a really effective answer to sticky zips on shooting luggage, slips, holdalls, clothing and of course the dreaded welly boots. Footwear in particular suffers from snagging zips, which is hardly surprising when you consider all the muck and gritty mud that gets into them. 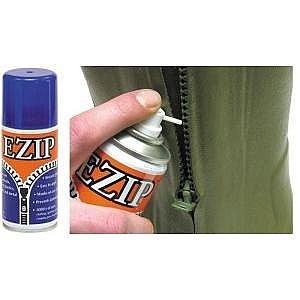 EZIP simply sprayed directly onto the offending zipper, will penetrate the teeth and by gently working the zip a few times will evenly coat the whole zip surface making sure that it runs smoothly and stays that way. Even on new products, metal, or plastic type zips run without sticking with just a single application of EZIP. EZIP is a safe, non oily film that drives out abrasive particles and leaves an unbelievably slick friction reducer on the actual teeth and puller mechanism. 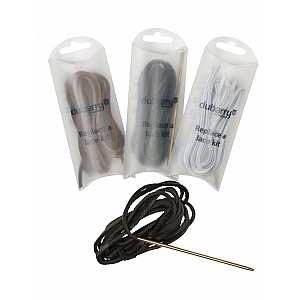 EZIP can be used safely on any type of zip, and will not harm, rubber, plastic, PVC, metal, or surrounding fabrics. It will greatly extend the life of the items, as zip failure is the most common reason for scrapping clothing, footwear and luggage. Use EZIP in shooting products, fishing gear, clothing, tents, camping kit, wetsuits, waders, diving vests, automotive heavy duty truck & ATV covers, and 100’s more applications. 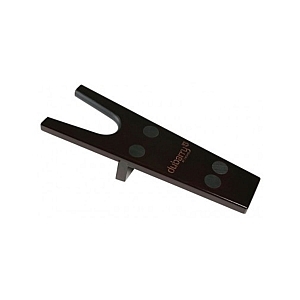 EZIP can also be used to free up sticky mechanisms in almost anything and is ideal for curtain pullers, sliding door gear and to reduce friction any hard sliding surface. 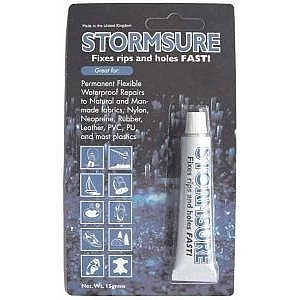 A permanent,flexible & waterproof solution to holes & tears in neoprene,rubber,leather and most other materials. 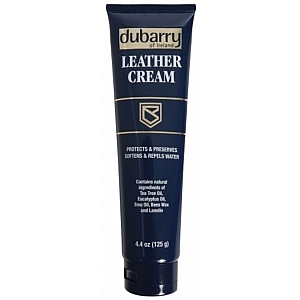 Dubarry Footwear Conditioner is the ideal leather conditioner for your Dubarry boots and deck shoes. The leather conditioner is a water-based flurochemical that will condition the leather bringing it back to a new look while also offering water repellency and high levels of oil and stain resistance. 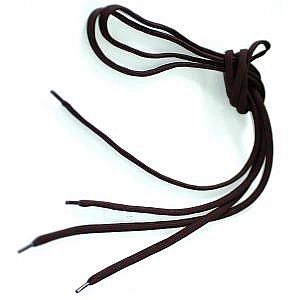 It is of particualr benefit to smooth leathers. 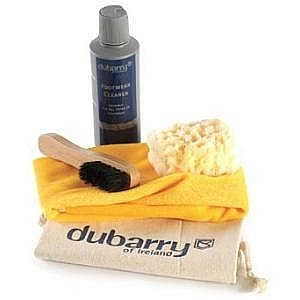 Dubarry Leather Suede Protector Spray is the worlds first water-based fluorochemical spray for footwear. In addition to restoring a water repellent finish, this spray offers a high-resistance to oil and stains. 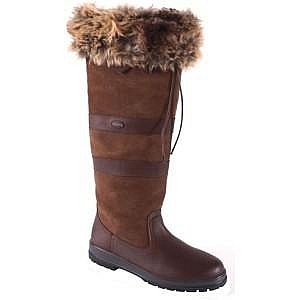 It is extremely durable and will work on all types of nubuck and suede leather. 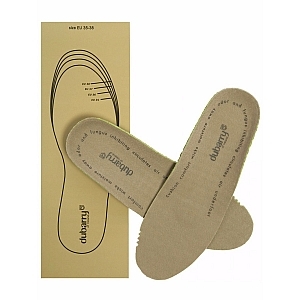 This Dubarry footbed is a not only a boot accessory suitable for our range of quality leather boots, but also suitable for our range of loafers, moccasins and men’s and ladies deck shoes, adding comfort and support. 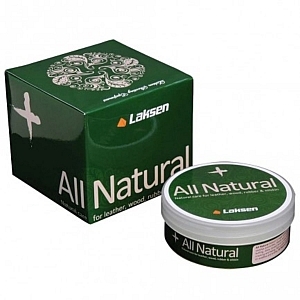 All Natural Balsam contains only natural ingredients such as beeswax, lanolin and coconut oil. A unique balm for care and maintenance of leather products, rubber boots, oilskin fabric, wood, plastic and vinyl. Easy to apply with the supplied sponge. 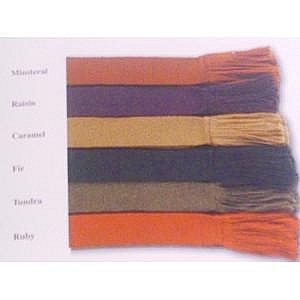 Maintains leather and rubber soft and flexible with a uniformly colour surface. Lightly water and dirt repellent. 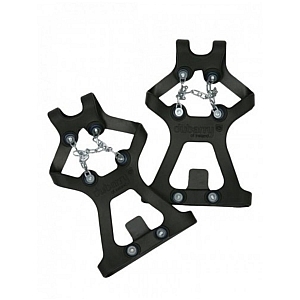 Sole chain to help with grip in icy conditions. GMK Boot bag is available in Green or Brown. GMK Wellington bag is available in Green or Brown. 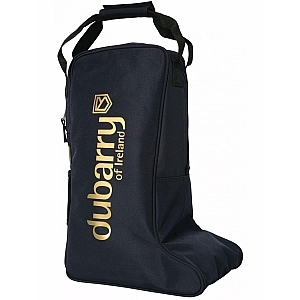 The large size boot bag is ideal for all the tall boots in the Dubarry collection. Carry your boots securely and keep your vehicle clean in the process. Fleece boot socks for superior comfort and warmth. Perfect for everyday, these socks are made from a stretch-cotton blend, making them soft and breathable. Featuring a classic polka dot design in a range of pretty colours and finished with a contrasting heel and toe. 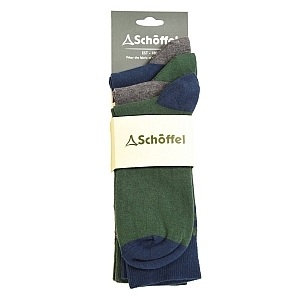 The Schoffel Beck Bamboo Socks are the ideal choice for your everyday wardrobe. 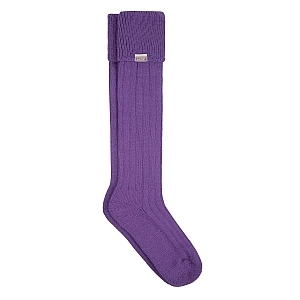 Crafted using natural bamboo viscose fibres, these socks are super soft and incredibly comfortable. Designed to keep your feet warm in winter and cool in the summer, these bamboo socks are the perfect year-round choice for your feet. Bamboo fibres help to wick moisture away from the skin, keeping odours to a minimum and ensuring your feet feel fresh all day. 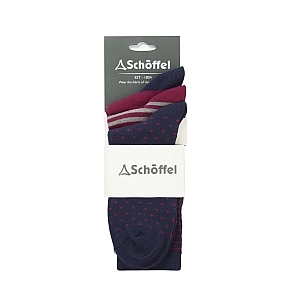 In a handy pack of 3 socks, each with a different pattern with contrasting heel and toe designs, these socks are great to add to your underwear drawer. Stylish and colourful stitch design. MerinoAcrylicLycra with a Nylon reinforced heel and toe. The Stapleford Stitch sock features a stylish stitch design and made from a soft Merino wool blend providing luxurious comfort. 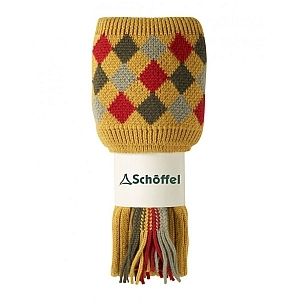 Available in colours designed to compliment other garments in Schöffel`s womens range. 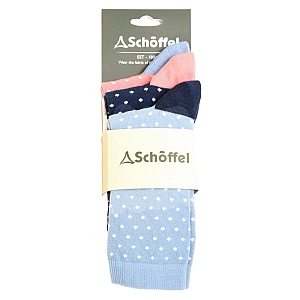 Perfect for everyday, these socks are made from a stretch-cotton blend, making them soft and breathable. Featuring a classic stripe design in a range of tonal colours and finished with a contrasting heel and toe. 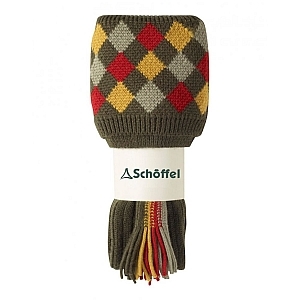 An essential addition to your everyday wardrobe, our Schoffel Spey Sock comes in a handy pack of 5 pairs. Crafted from a stretch, cotton rich blend, these socks are soft, breathable and comfortable, perfect for keeping you feeling fresh all day. 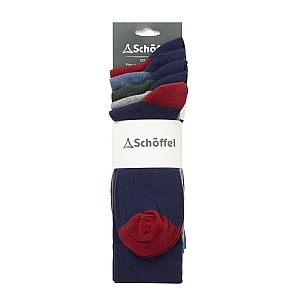 In a range of classic colours with subtle ribbed design and contrasting heel and toe, these cotton socks add a pop of colour to your footwear wardrobe. Ptarmigan shooting socks featuring a unique multi coloured diamond cuff design with matching garters. 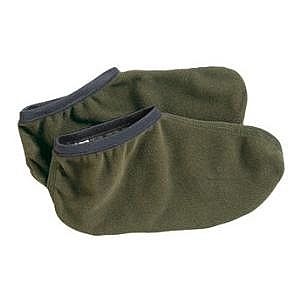 Made from a soft Merino wool blend for optimum comfort. 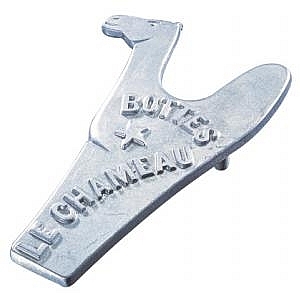 The perfect accompaniment to any shooting outfit. scrubs boots clean, connects to hose pipe.